I have two reasons to love Yuforia: their frozen yoghurt is tasty and I met a girl there for the first time who has now become a very good friend of mine. It’s like a little love story. With froyo. And y’know, on a completely platonic level. After reading and hearing about Yuforia for weeks from Catty (who may be the branch’s single-most-enthusiastic punter, I’m pretty sure she was going there every day for a week at one point), Genie from Young & Poor and I decided to check it out and, yes, meet for the first time. 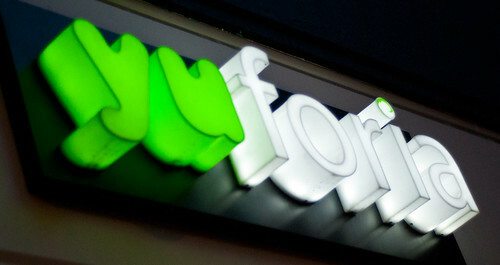 Tucked away on Beak Street in the middle of Soho, Yuforia’s bright green signage beckoned to me from The Golden Square. This was back in September (I know, I’m terrible) and London was still filled with sunshine and promise. I wandered in to wait for Genie (who is worse than I am at time-keeping, which is really saying something!) and snap a few photos. The first thing you’ll notice as you walk into Beak Street’s Yuforia is that it’s very green. I mean literally: the wall is covered in green foliage – ivy, I think. The chairs and tables are great big logs – it feels very natural. With the sunlight streaming through the mostly glass shop front it was easy to imagine that you were in a forest… er, a forest that served frozen yoghurt, that is. Even more impressive, the green was 100% real. The staff admitted it was, at times, hard to maintain, but it is so very beautiful and, in my opinion, worth it. It’s not often that you walk into somewhere like that and are met with beautiful foliage, watered by an incredibly elaborate system that’s set behind the wall. Also, there’s this incredible earthy smell that accompanies live plants, which I really love – it makes you feel very relaxed, which sounds bizarre, I know, but it’s true. Lovie, one of the girls who works in the Soho branch, was sat on one of the log chairs, on a break, eating some of their chocolate frozen yoghurt, wondering why I was taking photos of their shop. Usually I slip under the radar – it’s not that unusual to see an Asian girl in Soho with a big dSLR – but when you’re one of only four people in a small shop (and that’s including the two staff members), you tend to stick out a little. I’ve tried frozen yoghurt before, the first time was in LA at Pinkberry with my cousins, then a few little branches in Portland, and a couple of other competitors in London, and it’s got to be said: not very much beats Pinkberry. There’s a smoothness and creaminess to the yoghurt, accompanied by the sharp tang of the natural flavours. Even Raphael said that nothing could beat Pinkberry for him, but y’know what? Yuforia comes pretty darn close. It far outstripped one of the other leading competitors in the UK at the moment, whose froyo I found to be too sharp, too sour, leaving behind nothing but a slight trace of off-milk and disappointment. The Natural flavour was creamy and moreish, the Mango & Passionfruit had a lovely sweetness to it that was unexpected, but the real winner here was the Chocolate. Wow. The Chocolate. I’m not even a particular fan of chocolate, but this was completely mouth-wateringly delicious. It actually tasted like chocolate, or maybe cocoa, and there was a kind of dustiness to it that you only get with really good chocolate. 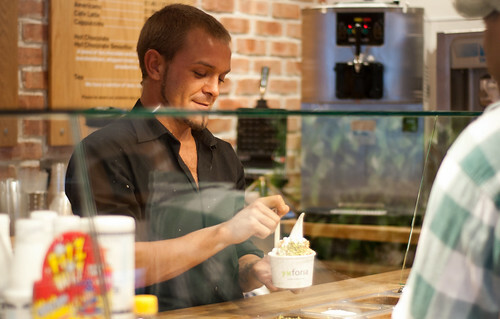 The thing is, Yuforia is not just (extremely tasty) frozen yoghurt – they want to be more. At the time they were planning on converting the Covent Garden branch into a Soup Kitchen (a feat that has now been achieved), they were about to start serving breakfast porridge, courtesy of Rude Health, for the on-coming winter weather, were already doing coffee and smoothies, and remember how the wall was covered in green foliage? The natural approach was something the company founder Leo Bedford let filter into all aspects of the company: even the spoons were bio-degradable. And frozen yoghurt is healthy. How often can you claim that for other sweet treats? And as for price, well, very decent. Very decent indeed. I was so impressed by their ethic, and, even better, Raphael and Lovie genuinely seemed to love working there: you really can’t get a better opinion about how a company works than from the staff. At this point the Soho branch had only been open a month or so, but they already had a whole stream of regulars, some of whom would only pop in to say hi and be greeted with a friendly smile. When Genie arrived she was greeted with just the same amount of friendly enthusiasm as I was, she too was given some samplers to pass judgement on, and then the two of us got down to the business of becoming firm friends and working our way through our giant pots of froyo (I had the Natural, Chocolate and Mango & Passionfruit, topped with white chocolate curls, strawberries and pistachio; that’s another thing – they have an incredibly large selection of toppings to choose from! Win). Genie was just as impressed with the froyo as I was; it was, in fact, her first taste, and she was loving it. If they can win over a first-timer then that’s always saying something. We left several hours later, having watched multitudes of people come and go, and talked about everything under the sun, and maybe that’s why I really loved the Soho branch: it was a place where you could kick-back, relax, and watch the world go by; but even more than any of that stands the fact that Yuforia do good froyo, and they have the potential to do so much more. Watch that space – they’re here, they’re fabulous, and they’re sticking around for a while. Have you tried the Covent Garden Yuforia Soup Kitchen? Or tasted the Rude Health porridges? I’d love to know what you thought! Drop me a comment and share the knowledge. So friends, until next time, peace, and of course, love. Sounds like an amazing shop! I can’t believe they’re doing breakfast porridge – how’s THAT for remedying fro-yo business in the winter? I like the whole idea of the live ivy inside…sounds lovely. I’m pretty sure I would gobble down the passionfruit yogurt! I LOVE PASSIONFRUIT! That last picture just does it for me ! !I want to know know how they are pulling off breakfast porridge. Funny thing is I’ve tried froyo. I’m more of a gelato fan. I know you have been feeling overwhelmed…remember to take good care of yourself sweet girl! You are so talented, and I know you are getting pulled in a million directions. I love reading your posts…this made me want some yogurt with nuts right now! Thanks for sharing…and please know you are in my thoughts! And they have pistachio for toppings!! That’s awesome. I have multiple froyo shops around the school campus, on and off. This is SoCal, after all. But I still think I prefer real soft-serve ice-cream. Froyo is too…healthy? Icy? not as creamy as gelato. I have a friend whose last name is Yoo. She’s an artist, and she wants to form her own design company called Yoophoria. Haha! Jax, I had noticed frozen yogurt in the UK but somehow didn’t think to try it. Yuforia sounds better than the other options I had seen, yet I am shocked that you chose chocolate (natural or otherwise!). I enjoyed the review, though I have to admit that I never tried Pinkberry yogurt and guess I should find out what all the fuss is about…. Thanks for finding me again! Nice to read your blog too. This place sounds great. I’m going to London in a few weeks so I’ll have to remember this gem. NOM! That looks incredibly tasty… Even though it’s in the 50s here, I would love a big bowl of that right now. Delish! Your blog is tres interesting. Wei-Wei: it’s a great way of keeping your business afloat in the Winter when you’re primarily a Summer product, isn’t it? I’ve got to go back and try their soup kitchen now that Winter is upon us! Ash: it was delicious. Seriously. But the chocolate, mhm, even better! Catty: have you tried their Covent Garden branch yet? Heather: ha, if Yuforia alone can make you move then I’d be very impressed indeed! Monet: you are so very sweet – thank you! Sophia: how funny :D But I do know what you mean re. 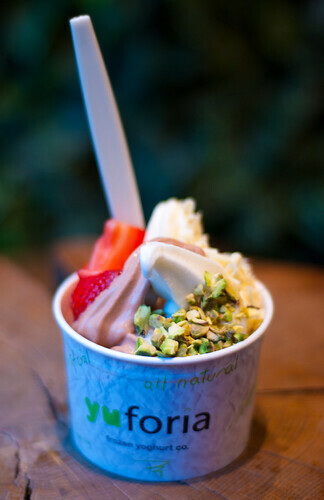 froyo… but then I think you need to try Yuforia! 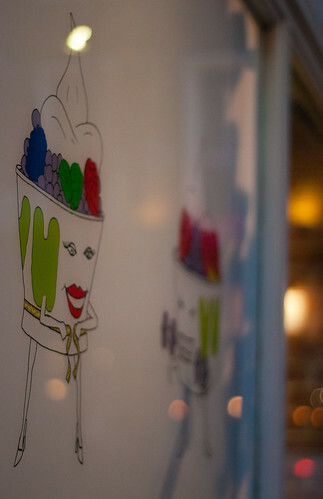 Dan: I’m not sure it’d be up your alley… but you definitely should try Pinkberry. Let me know what you think! ATIE: let me know if you try it out! Cupcake: what a great name – thanks!